On May 24, 2018, in accordance to the approved schedule, the Ministry of Justice of the Republic of Tatarstan left for the Chistopol Municipal District. As part of the trip, legal assistance was rendered by the leading consultant of the department of legal consulting and methodological support of local governments of the ministry Elena Gazizova. Responsible officials of local self-government bodies discussed problematic issues encountered in the course of practical activities, provided advisory assistance, and provided recommendations in order to increase the effectiveness of their work. 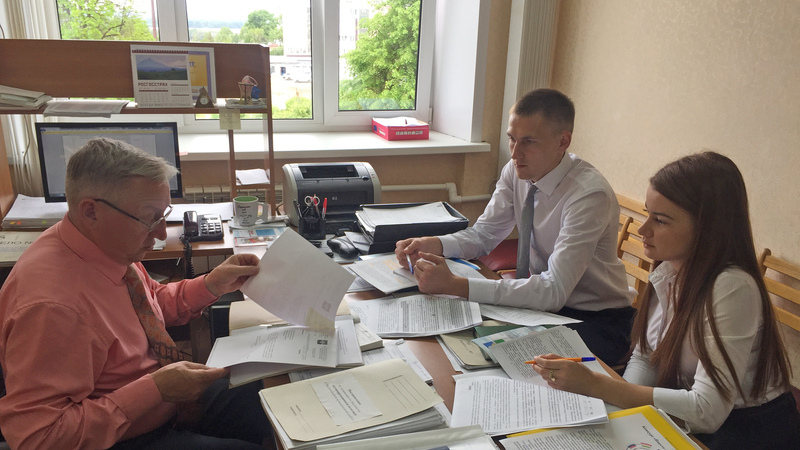 The staff of the department of information and analytical work, coordination and planning of the Ministry Ilfat Mingalimov, Alina Sharafetdinova carried out a check of the implementation of the state program «Implementation of the anti-corruption policy of the Republic of Tatarstan for 2015-2020» in the Chistopol Municipal District. The issues of the functioning of the commission for the coordination of anti-corruption work for the head of the Chistopol Municipal District, the commission for compliance with the requirements for service conduct and conflict of interest settlement, examined the municipal anti-corruption program, the organization of the anti-corruption expertise, and the implementation of other program activities. On April 18th, 2019, a verification of the implementation of state powers of the Republic of Tatarstan by local self-government bodies of the Rybno-Slobodsky municipal district on collecting information needed for the maintenance of the registry of municipal normative legal acts of the Republic of Tatarstan from the settlements belonging to municipal district, organization of the work on sending the municipal normative legal acts and information about them from the settlements of the Rybno-Slobodsky municipal district was provided and the other aspects related to interaction between responsible person and local self-government bodies on the settlement level were discussed by Lead Consultant of the Normative Legal Work in the Field of Local Self-Government and the Maintenance of the Municipal Register Division Gibadullin T.D. The problematic issues were discussed, the necessary legal and advisory assistance were provided and the recommendations for improving the efficiency of work in the implementation of state powers were given during the audit. On the April 17th, 2019, in the context of the education activities on the purposes and objectives of state civil service, First Deputy Minister of Justice of the Republic of Tatarstan Galimov A.G. participated in the meeting with the students of the «TISBI» Management University. Galimov A.G. described to the students the objectives, purposes and social value of the state civil service of the Republic of Tatarstan, benefits of working in the bodies of state power, the objectives and areas of the Ministry of Justice of the Republic of Tatarstan activities, prospective projects being implemented in the Ministry. On April 17th, 2019, a meeting of the attestation commission of the Ministry of Оustice of the Republic of Tatarstan was held at the Ministry of justice of the Republic of Tatarstan. The session was on the compliance for the replaced civil service positions of the Republic of Tatarstan. The team of the Ministry of Justice of the Republic of Tatarstan made up of Garipov Rauf Uralovich, Gavrilenko Elena Yuryevna, Elina Ludmila Nickolaevna and Kuzyurov Reslan Ravilevich was ranked 3rd place in the competitions in chess within the Spartakiada Games of state employees of the Republic of Tatarstan 2019.